Everything your iPhone ever Needed, Never delete another Photo again from your iPhone 6, iPhone 6S, iPhone 7, iPhone 8. Add wireless charging to your iphone without upgrading to the latest phone. - Power - 2600Mah Smart Battery provides 100% charge for your iPhone 6/6s/7/8, Program the ZEE CORE to start charging when your phone hits 5% or any % you are interested in. and stop autonomously. - Memory Storage - Add 128Gb memory to your iPhone 6/6s/7 and free up some space on your device. copy files from your PC/Mac on the go, its like having a portable hard drive on you at all times. hundreds of Movies thousands of songs and millions of work files with no need of i Tunes for viewing or transfer. - Wireless Charging - Add the ability to charge your iPhone wirelessly via QI base charge pads (sold separately) and free yourself from wires. 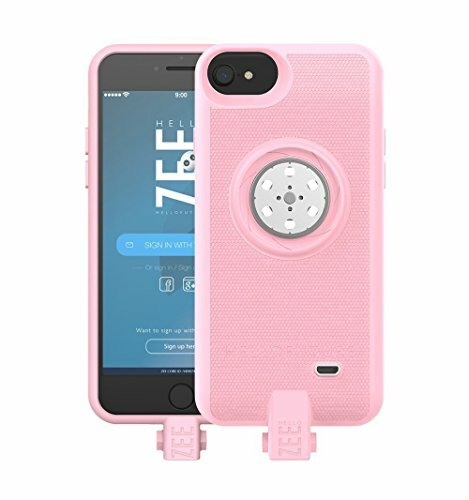 The ZEE Smart case is Allows you to charge Via 1, Micro USB 2, Wirelessly 3, and still have easy access to charge via The apple lightning port. - LED Light - Powerful 6 X 2W LED light controlled by our FREE ZEE core APP, turn on or off, dim or expend the light , switch to flashing emergency light or pump up the vibe with music sync mode. - Protective case - High End Smart Case fits your iPhone 6, iPhone 6S, iPhone 7 perfectly with the ZEE core within it. keeping it all at a slim profile protecting your precious CORE and mobile device from drops and dings. - Universal - The ZEE core smart case you will be receiving comes with a cover for iPhone 6, iPhone 6S, iPhone 7, though if you chose to use your ZEE CORE with any other Apple phone or tablet just get a different matching cover for iPhone 5/5s/6/6s/7/6P/6SP/ iPad Mini 1/2/3 iPad Air. and your good to go. - Accessories - The Zee core smart case comes with a great variety of accessories. If you have any questions about this product by HELLO ZEE, contact us by completing and submitting the form below. If you are looking for a specif part number, please include it with your message.